In 10-inch nonstick skillet, cook beef and onion over medium-high heat 8 to 9 minutes, stirring occasionally, until brown; drain. Reduce heat to medium; stir in chiles, soup, sour cream and salt until well blended. Place half of the Tater Tots™ in single layer on bottom of baking dish. Pour beef mixture on top. Top with 1 cup of the Cheddar cheese, then with remaining Tater Tots™, then with remaining 1/2 cup cheese. 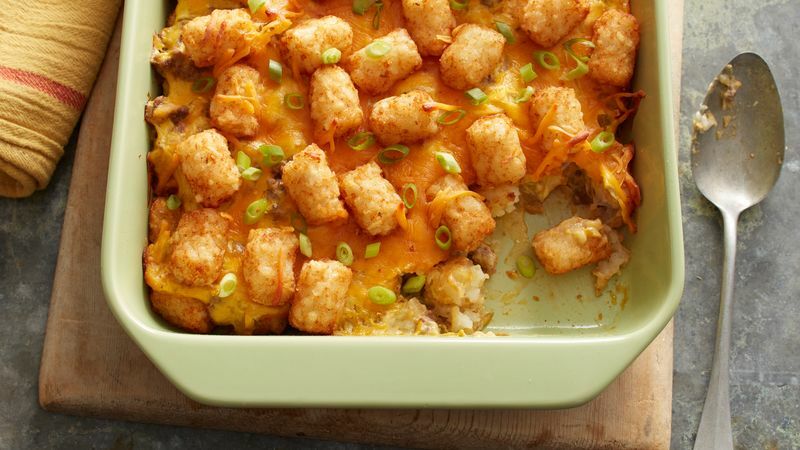 Bake 45 to 55 minutes or until casserole is bubbly and Tater Tots™ are lightly browned. Top with green onions. Use shredded pepper Jack cheese in place of Cheddar cheese to add some extra zip. Store leftovers in refrigerator up to 3 days – just reheat and enjoy!